Advertorial: IN 2018, Scotland came together to celebrate its younger generation. In a year dominated by political uncertainty, young people were the positive force in making change happen. More than 2,000 young people were at the heart of it, and planned a calendar of sporting, music and cultural events for all ages to enjoy. A world-first initiative, Year of Young People was a commitment made by the Scottish Government. Young people worked alongside decision makers to make sure they were involved in the creation of government policy. This year, they established a Youth Commission which examines mental health services. They will have a greater say in their education with the creation of a Scottish Learner Panel, and will hold those in power to account with the launch of the First Minister’s Question Time for children and young people. 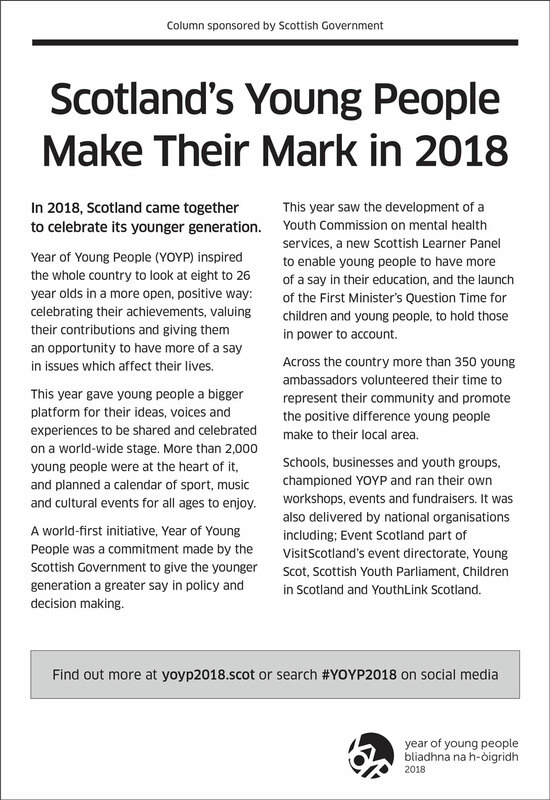 YoYP was delivered in partnership with local and national organisations including schools, youth work services, EventScotland (part of VisitScotland’s event directorate), Young Scot, Scottish Youth Parliament, Children in Scotland and YouthLink Scotland. More than 350 young ambassadors volunteered their time to challenge the negative stereotypes of their peers. Their role is to represent their local area, promote activities and showcase the positive contributions young people make to their local community. 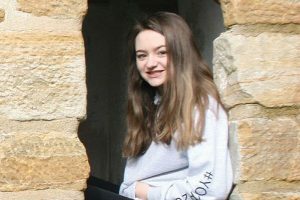 Orkney’s Hope Laing was one of those who volunteered to be a young ambassador. She said: “Year of Young People has given Scotland an opportunity to build young people’s reputation, and provide more opportunities for them to influence and take action. “I am very proud that I have been one of the ambassadors for my area, and being involved in helping young people shine in my local community. “A few highlights are: Stromness Drama Club winning the National Youth Festival; Estrella, on their amazing Young Enterprise Venture which won three awards at the Young Enterprise Finals; and their Managing Director, who has been announced as Young Entrepreneur of the Year! “One group which I am part of, the West Mainland Youth Achievement Group, had success this year competing in the MoneyforLife scheme. We went to London to represent Scotland at a National level and won with our project called ‘Trash to Cash’. “During my time as ambassador, I have had the privilege to meet and work with so many people from all walks of life. Without this opportunity, I don’t think I would feel as confident as I do now when taking on new challenges.